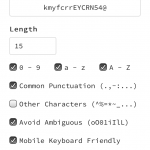 cxam has updated his excellent password generator passed.pw designed to generate passwords that are easy to type into a smartphone or other mobile device. The problem with normal passwords designed for a full keyboard is that it is tedious to switch back and forth between the primary and secondary keyboards of a smartphone. This password generator minimizes the switches by grouping lowercase letters, uppercase letters, numbers and punctuation into separate groups in the same password string. You have options for increasing complexity as well as reducing ambiguity by avoiding the ambiguous characters o O, 0, etc, which look alike. A picture is worth a thousand words – here is passed.pw operating on an iPhone browser. 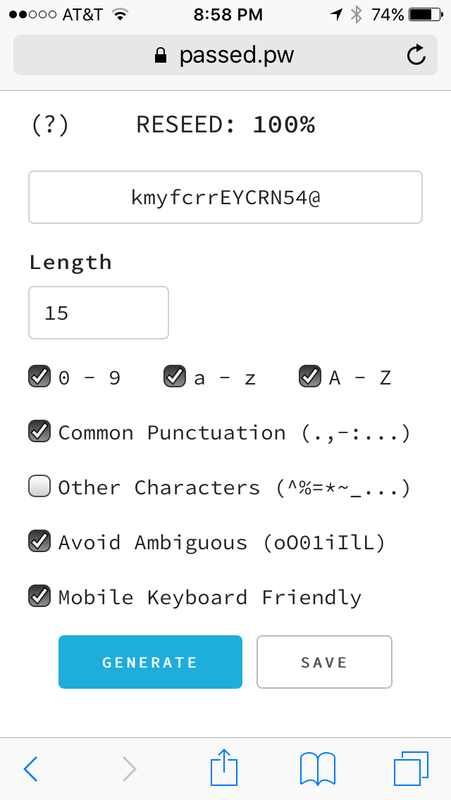 I have generated a 15-character password with numbers, lowercase and uppercase letters and common punctuation. I have chosen to avoid ambiguous characters and have made the password easy to enter into a mobile device. Check it out: passed.pw. And store your passwords using secure means like LastPass or KeePass.